Records continue to fall. Robert Hoppe of Reno, NV just smashed the NBRSA 600-yard record with a 0.579″ five-shot group at 600 yards. Don Nielson just called with the news from this weekend’s 600-yard NBRSA match at the Sacramento Valley Shooting Center. Robert was shooting a 6mm Dasher with Varget powder and 105gr Hornady Amax bullets. His gun has a 28″ Hart Barrel, Panda Action with Jewell trigger, Dierks carbon fiber stock (photo below), and Nightforce 8-32X scope. At the match, Don Nielson was using one of the new 10-60X52 March zoom scopes. Don has one of three prototypes now in the USA. Don reports: “The scope is outstanding. I could see bullet holes very well at 600 yards in the white. In the light blue area of the target they were harder to pick out, but still visible in good conditions.” Don promised to provide some photos of the new March 10-60 when he returns from Sacramento. Rumored price on the new scope, if it goes into production, will be $2500-$2600. Share the post "Hoppe Breaks NBRSA 600-yard Record with 0.579" Group"
Results for the 2007 Western CMP Games and Creedmoor Cup Matches are now availalble online at the Civilian Marksmanship Website, Odcmp.com. To navigate directly to the results page, CLICK HERE. The CMP Games ran Oct. 20-23. The Creedmoor Cup started on Oct. 24 and will conclude this sunday, the 28th. Share the post "Western CMP Games Results"
Now through November 30th, MidwayUSA has sliced $15.00 off the price of the our two favorite Harris Bipods, the BR swivel model and the Medium (9-13″) swivel model with notches. If you don’t have a Harris bipod yet, now is a great time to buy. With light-recoiling calibers, the short, 6-9″ Benchrest model Harris bipod works very well on benches and is more handy than carrying around a big, heavy pedestal front rest. This short bipod works great with many rimfire rifles. For bench-shooting, the “S-BRM” model with swivel, Midway item 155546, is ideal. We like the fast and positive height adjustment offered by the leg notches. If you prefer, the S-BR model without notches, Midway item 652827, allows you to fine-tune the leg height. Both “BR” bipods are sale-priced at $79.99 ($15.00 off regular price). For field use, we recommend the larger Harris model “S-LM”, Midway item 328534. 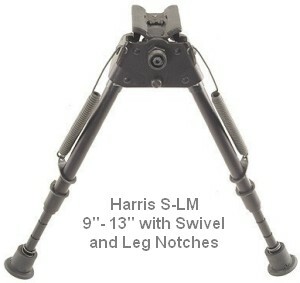 Also on sale for $79.99 ($15.00 off), the Harris S-LM adjusts from 9″-13″ using leg notches. When shooting in the field it is faster and easier to adjust leg height with the built-in notches. The greater height (compared to the BR model) helps you shoot over the grass or compensate for small mounds between your muzzle and the target. 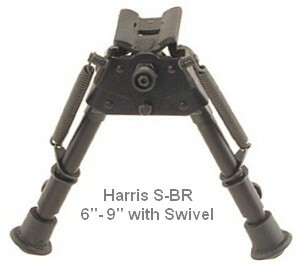 Share the post "Harris Swivel Bipods on Sale Again At MidwayUSA"